Rejoice, revel, repent, set the SatNav to Stephen Fry and pull over for gas. The Wave Pictures are back with their fifth studio long-player – City Forgiveness; an epic and quintessentially English ode to inertia and exploration on the interstate. The twenty-track double album is a direct result of six weeks driving around America last year with Allo Darlin’: “We visited Hank Williams’ house and Billy The Kid’s grave, watched the Golden Gate Bridge disappear into the clouds and had our frisbee confiscated by a cop. We played some great shows together, became good friends and we drove and we drove and we drove and we drove” explains vocalist and lyricist David Tattersall. In between shifts at the wheel and arm-wrestling Texan truckers for Twinkies, Tattersall scribbled fastidiously into a notebook and on his return to London found “a few hundred crumpled, well-travelled pages at the bottom of my bag”. These crumpled notes formed the basis of City Forgiveness and in typically prolific style Tattersall wrote twenty songs in “a very jet-lagged and confused week”. To those familiar with the band’s work – and particularly 2011’s Beer In the Breakers – the resultant album is a trademark blend of slow-bent Stratocaster and sustained vibrato with semi-mundane-bordering-on-the-deeply-profound stories decanted atop. 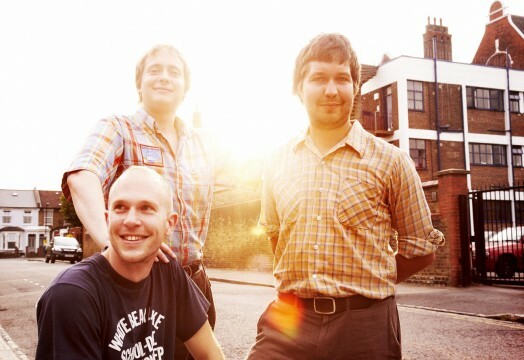 The Wave Pictures are a band unwilling to accommodate fads and trends, and are as equally unlikely to disappear off into the desert with Josh Homme as they are to entertain the notion of a dubstep remix. They make music to satisfy themselves, rather than the needs of others. For the main City Forgiveness plays to the band’s strengths, dishing out dry humour and wry lyrics (“It went on joylessly, joylessly like the 1990s”) against a backdrop of virtuoso string-tickling and solid tub-thumping. There are deviations however, and these occasional audio detours take in boozy, bagpipe-esque trumpets (Narrow Lane) and cocktail lounge piano tinkerings. Though the majority of the album has cruise control set to strain the cylinders at a speed-trap bothering tempo, it does also drop in pace occasionally, slowing melancholically and introspectively for maudlin moments. Strangely for a Wave Pictures album, nine out of the twenty songs are longer than five minutes – a fact presumably attributed to the wide open spaces and vast vistas encountered on their road trip which are represented by uber-ambling drum rolls and rambling, tangling guitar solos. The geographically astute amongst you may question the inclusion of recent single Lisbon, but let me explain. Although the LP owes a certain debt to dust bowls, panhandles and turnpikes, it is not a concept album about America so much as a testament to the way that travel excites the imagination. Fans of continuity and Iberia will be pleased to know that Portugal also gets name-checked in The Inattentive Reader, whilst word nerds will be delighted to learn that City Forgiveness revisits earlier lyrical references to beans (coffee), dreams (unattractive nurses) and swimming from David Tattersall’s enviable arsenal of one-liners. City Forgiveness is an album which will delight old fans and intrigue new ones. It should be revered, rewound and placed on heavy rotation. Whether you’re traversing Route 66 or the M62, you’ll be sure to find something here to grease your auricles, jack your chassis and wax your exterior. The Wave Pictures are touring from now until Christmas and probably beyond. City Forgiveness is released on 21 October via Moshi Moshi. Stick your thumb out and hitch a ride with them before the widespread recognition that’s been tailing them for the best part of a decade finally catches up.